Bitrix welcomes you to an important new phase of connection and collaboration with the new update of Bitrix24. 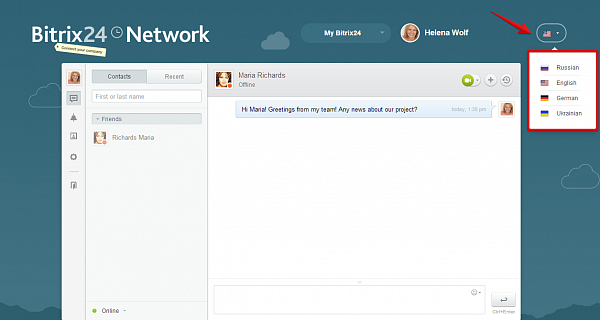 The centerpiece of this update is the Bitrix24 Network - this new service makes communications with clients, business partners, colleagues and suppliers easier than ever before. Bitrix24.Network brings together all of your business contacts and unites companies. Why will the Bitrix24.Network change your company's life? When creating it, we were primarily thinking about the simple communication pattern between companies and external users, because what is important today is not only to unite the employees within the company, but also help companies to communicate with each other and with the "outside world"
Every company faces the question of organizing events, procurement of goods, and other everyday issues that occur "outside" the company – with your road warriors, contractors, suppliers, business partners and customers. The usual process is to take down phone numbers on our mobile, and clarify details and verify participation by phone, email, or whatever else works, finalizing with an mass email. Now all that can be done in Bitrix24 Network. Invite your colleagues to your Bitrix24.Network and get in touch any way you choose: via business chat - either one-on-one or in a group chats; make a video call; or even se t up video conferencing for up to 4 people. 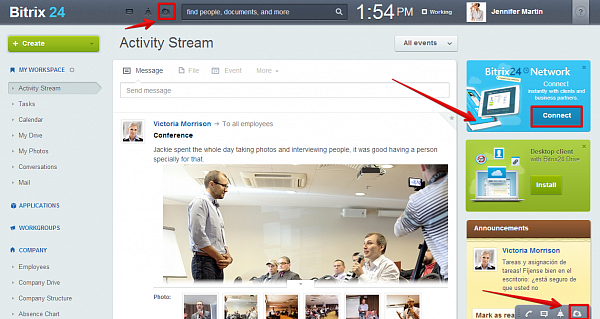 No additional settings are required; you can work in Bitrix24.Network directly from your browser. 1. Go to www.bitrix24.net - welcome to Bitrix24.Network. 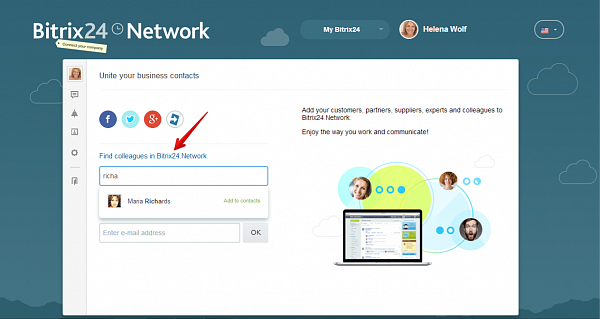 Register your free Bitrix24.Network account or log in using one of your social network accounts. Then invite your contacts from these and other networks and open new horizons in communications. 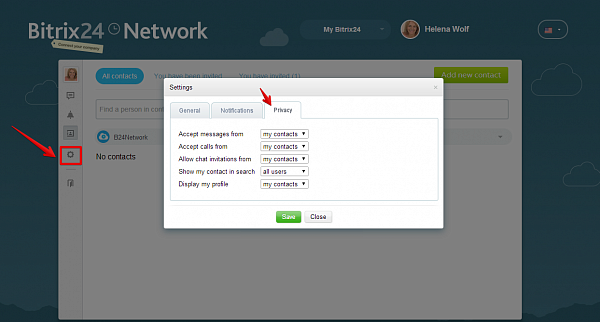 You will also see a new tab for Network notifications in your portal's interface. 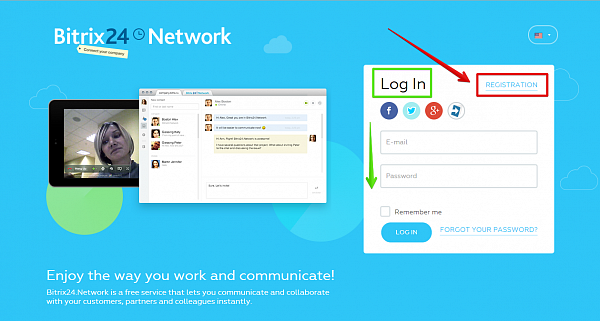 It is easy to invite your existing friends, colleagues and other contacts to your Network - connect a social network and all your friends will appear in the contact list. Or maybe your partners or colleagues are already inside? Try to find them with a quick search and add them to your contact list. Or you can also invite them to Bitrix24 Network by sending an email invitation. When the person you've invited opens the Bitrix24.Network opening page - it will welcome him or her with your photo and the invitation text that you've sent. 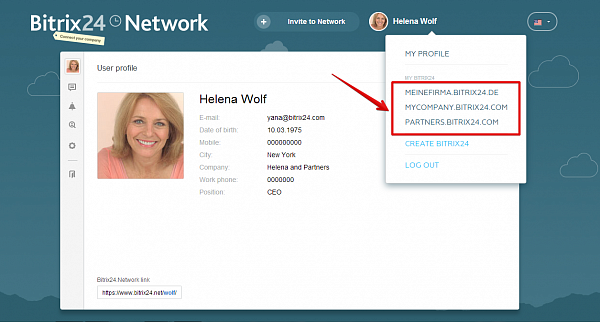 The person you've invited registers on Bitrix24.Network and immediately sees you in the contact list. 5. Have several Bitrix24 accounts? 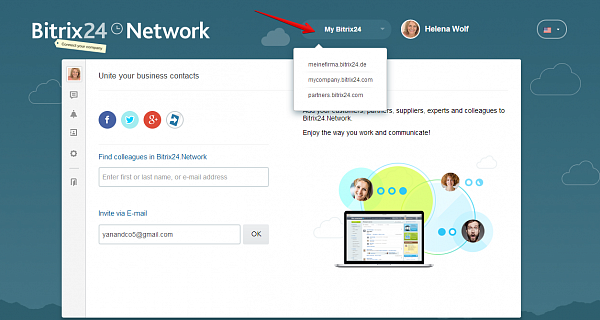 Switch between your Bitrix24 portals easy and conveniently directly from the Network, without further authorization. You no longer need to remember passwords, since single authorization will allow you to keep one password and email but access any of your Bitrix24 accounts. 6. 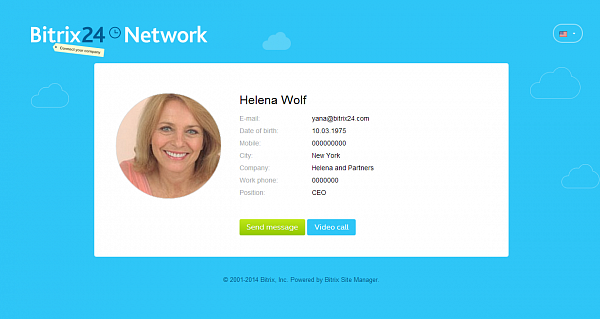 You don't need to spend money on your own business card - it is already created inside Bitrix24.Network and can be attached to email or simply sent to the client. Bitrix24.Network business cards do not just talk about you, but also allow the person who received it to navigate quickly in the Network and call you or send you an instant message. 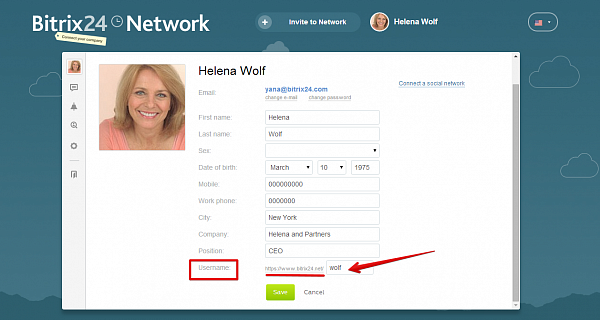 You can add additional information to your business card via profile settings. The link to your network profile at the bottom is your business card link and can be customized by going into "edit profile" mode. 7. To access the interface language tab, you now need to authorize first and after that you will be able to choose the language in the right top corner. 8. Additionally, you can now log in to your Bitrix24 account from the bitrix24 website -www.bitrix24.com.